The Gaggia Brera Espresso Machine may not look like a modern-day espresso machine at first glance. Indeed, some of us here have described it as an “old radio,” “lunchbox,” and “futuristic make-up kit.” But, we assure you: It comes with several useful features, some of which are surprisingly ingenious, making it an effective coffeemaker indeed. Before we discuss the Gaggia Brera Espresso Machine’s innovative features, allow us to tell you all about its features that are common among commercially available coffeemakers. You wouldn’t trust a product that can’t function as expected, would you? Let’s begin with the Gaggia Brera Espresso Machine’s body. It measures only 10″ x 15.5″ x 11.5″ in dimensions, and weighs a mere 19 lbs (25 lbs when shipped), so we trust it won’t take up more space than you’d like to give it. The body itself is made of plastic and metal. To be precise: It consists of a plastic top, plastic sides and a metal-panel front. Both the plastic and metal parts are sturdy, so you need not worry that the espresso machine itself is flimsy. 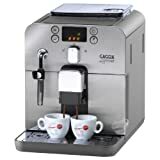 To ensure it prepares nothing but great coffee, the espresso machine comes with 15-bar stainless-steel boiler, Pannarello stainless steel milk frothing wand, hot water-steam nozzle, and the Saeco adapting system for espresso. The boiler ensures full flavor extraction. The wand ensures the coffeemaker itself produces luscious crema. The nozzle makes preparing other beverages (e.g., tea and hot chocolate) a breeze. The system makes the espresso machine a truly versatile coffeemaker indeed. The espresso maker itself also comes with a cupholder. Now the espresso machine’s ingenious features. To make sure the espresso machine extracts all the flavor and aroma from the ground coffee beans, it comes with a pre-infusion feature. To make controlling it as easy as possible, it comes with several convenient controls: a knob on the coffee hopper for adjusting the coffee grind easily, a button on the front for adjusting the strength of the espresso, and easily accessible buttons for preparing espresso and americano-style long coffee. To save electricity, the espresso machine itself switches automatically into standby mode after one hour of being idle. To help ensure all of its parts remain in tip-top shape for as long possible, it’s programmed to notify automatically the user when it needs some maintenance. To help prevent impurities from finding their way into your coffee, it comes with the Mavea Water Filter, which utilizes four stages of filtration. Although it’s made of quality materials, according to a few consumers, the Gaggia Brera Espresso Machine isn’t as sturdy as it should be. The other complaints are: its beverage container capacity is limited and its small water tank necessitates several refills to make multiple cups of coffee, which is a pain when entertaining. It, however, has received a positive rating of 3 and a half stars out of 5 on Amazon. As we hope to have proven to you by way of the above review of the espresso machine, no product should be judged solely on their looks—even the most plain-looking device can be surprisingly useful.